Zomo CDJ Mixing Bag for 2x CDJ-100/200/400 + 12? Product information "Zomo CDJ Mixing Bag - 2x CDJ-100/200/400 + 12" Mixer"
The new Zomo CDJ Mixing Bag is a handy DJ bag to carry 2 Pioneer CD-Player CDJ-100, CDJ-200, CDJ-350 or CDJ-400 and 1 arbitrary 12 inch mixer such as DJM-600/700/800.This compact and yet very robust transport bag comes from the sacred halls of the Zomo producers and guarantees durable quality, an attractive design and perfect functionality. In addition, up to 32 CDs, some cables and other small items can be stored in the outer pockets. The extra thick and resistant padding protects the players reliably against damage and dust, the zipper secured by a lock protects against unauthorized access. Power and audio cables can be quickly and easily laid in the cable duct and then fed through a small opening into an external cable compartment. The cables can be stowed away for transport, so that the cabling can be done very easily and comfortably. 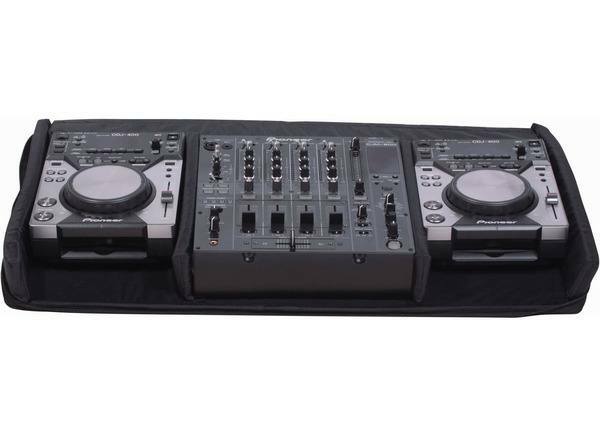 Be the first who writes a review for: "Zomo CDJ Mixing Bag - 2x CDJ-100/200/400 + 12" Mixer"